The Colorado Rocky Mountains are the perfect destination during the summer months, with warm days, cool nights, lots of sunshine and plenty of adventures for the entire family. Crested Butte Mountain Resort (CBMR) is the perfect jumping off point for summer family fun, thanks to family-focused lodging packages, dining options and adventures designed to maximize the travel budget while ensuring everyone has the time of their lives. CBMR is offering a value-minded Kids Stay & Play FREE package: children under the age of 18 stay for free and all family members on the reservation receive a free single scenic lift ride ticket to experience the mountain. The package is available at all CBMR Properties, including The Grand Lodge, the Lodge at Mountaineer Square and the Elevation Hotel & Spa, all conveniently located at the base of the mountain. The Grand Lodge features the resort’s largest outdoor pool and hot tub, an on-site family-friendly restaurant, and the Wildflower Spa. Looking for a bit more space? Book the Kids Stay & Play FREE package at the Elevation Hotel & Spa or the Lodge at Mountaineer Square and CBMR will sweeten the deal with 50% off lodging upgrades on selected room types. For the past few years, CBMR has been focused on adding new summer activities to enhance the experience for the entire family. Summer activities at the resort now include the Adventure Park, featuring a climbing wall with an auto-belay system, bungee trampolines, and the Flying Gopher Miniature Golf Course – 18-holes of a true Crested Butte experience. A new adventure added this year is the Crested Butte Zip Line Tour. The guided tour, which debuts in June 2011, includes five zip lines, ranging from 200-380 feet, and a series of features, such as a suspension bridge, a “Burma Bridge” and a net climb. The Crested Butte Zip Line Tour is available during the summer and winter seasons; the resort will offer the only guided zip line tour at a Colorado ski resort, and one of the only winter canopy tour operations in the state. The resort is also home to the Evolution Bike Park, which features over 25 miles of single track cross country and downhill trails designed to allow riders of all abilities to progress and improve their bike handling skills. The park experience begins at the Crested Butte Rental & Demo Center, where riders can choose from a full fleet of Specialized® rental bikes. The Crested Butte Rental & Demo Center also has pedal-less bikes made by Specialized® that are designed to teach young riders the basics of balance while learning to ride. The resort offers a variety of lesson packages, many including bike rental. Lessons are available in both two-hour and four-hour increments. If Mom and Dad need a little time to themselves, the resort offers kids’ day camp for children ages 3 through 14. Camp CB pairs quality childcare with fun, outdoor activities allowing kids to create their own memorable summertime experiences. For older kids – tweens and teens – the Camp CB Summer Adventure program combines outdoor mountain activities, Adventure Park access and summer sports with various educational themes. For the youngest adventurers, the Camp CB Nursery is the ideal location for children ages 2 months – 3 years old. Families also have the opportunity to explore the Trailhead Children’s Discovery Museum, located in the base area. The museum offers educational fun with exhibits such as the Dig Pit, The Trail Lab, The Pirate Ship Theater and many more. 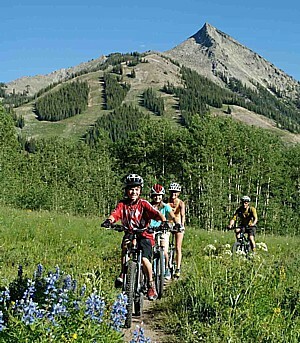 Family fun in the mountains also includes rafting, horseback riding, The Adaptive Sports Center’s Ropes Course or hiking in some of the wilderness areas that surround Crested Butte. The spectacular wildflowers throughout the fields, mountains, and valleys gave the area its official title of “Wildflower Capital of Colorado”. Also plan to take a stroll through downtown Crested Butte with its Victorian storefronts, old coal-mining influences, and quirky small-town character. When it’s time to fuel up, head to the base area or to town for kid-friendly favorites. The resort offers a great family atmosphere at 9380, the restaurant located slopeside in the Elevation Hotel & Spa. Patio seating is perfect on a warm summer day and 9380 offers a variety of options suited to all tastes. Plan to experience downtown Crested Butte in the evenings, where the restaurant options are almost endless. Families love The Secret Stash, a gourmet pizza joint where kids – and adults – can sit on the floor while they enjoy out-of-this-world options. Also check out Izzy’s for breakfast or lunch, to try a homemade bagel or potato latke. Another great place with lots of options at very reasonable prices is the Last Steep. Try the Curry Shrimp & Coconut Salad or the Fish Tacos, alfresco. Crested Butte is a community that loves festivals, concerts, and parties. For family focused events, visit during the Crested Butte Music Festival’s Bluegrass in Paradise weekend, July 5-10, with twelve bands performing over the weekend and an expanded Bluegrass Kids Camp for ages 7 to 17 on July 5 – 8. For those interested in the arts, the Crested Butte Arts Festival is taking place August 6 & 7, with 175 artists of all kinds exhibiting their work. The festival has added Art Alley, where budding artists (ages two+) are invited to participate in hands-on art activities that mimic the mediums of the exhibiting artists. All projects are free and kids can take home their own works of art. Also, every Monday and Wednesday through the months of July and August, free concerts are held downtown at the Crested Butte Art Center and in the resort’s base area. Summertime is the ideal time to slow down, relax and reconnect with the family in Crested Butte. There are endless options for adventure – for young and old, a tempting variety of events (guests will find something going on nearly every weekend), and incredible value thanks to packages like CBMR’s Kids Stay & Play FREE. For information or to book this great summer package visit www.skicb.com or call (800) 600-2803 begin_of_the_skype_highlighting (800) 600-2803 end_of_the_skype_highlighting. Nestled in the heart of Colorado’s Rocky Mountains, Crested Butte consists of a small historic town that remains true to its heritage and radiates an unparalleled welcoming and inviting spirit that celebrates a simpler life and time, and the mountain resort. Thanks to a widely diverse landscape, whether beginner or burgeoning national champion, outdoor enthusiasts of all levels will find a new challenge with each visit, from world-class mountain biking, to legendary skiing and snowboarding, to a secluded fly-fishing experience. For more information about Crested Butte’s lodging, conference, meeting facilities, and special packages, call Crested Butte Vacations, (800) 600-2803 begin_of_the_skype_highlighting (800) 600-2803 end_of_the_skype_highlighting or visit the web site at www.skicb.com. For information on ski area real estate opportunities call (970) 349-4999 begin_of_the_skype_highlighting (970) 349-4999 end_of_the_skype_highlighting or (877) 805-6109 begin_of_the_skype_highlighting (877) 805-6109 end_of_the_skype_highlighting or visit the website at www.cbliving.com.